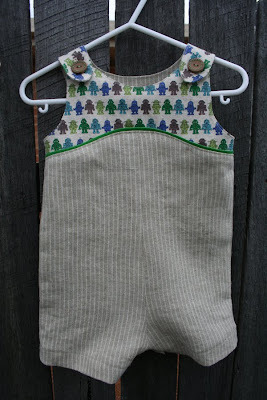 Nothing inspires me to sew like a friend having a baby. Baby E was born eleven days ago and is just delicious - super chubby cheeks and loads of thick, dark hair. Cluck cluck! I decided to make him a tea party playsuit, by Oliver + S. My motives were largely selfish - I wanted to try it out as I've never sewn one before, and I already had most of the pattern pieces traced and cut from making the tea party sundress last year. I am nothing if not lazy! 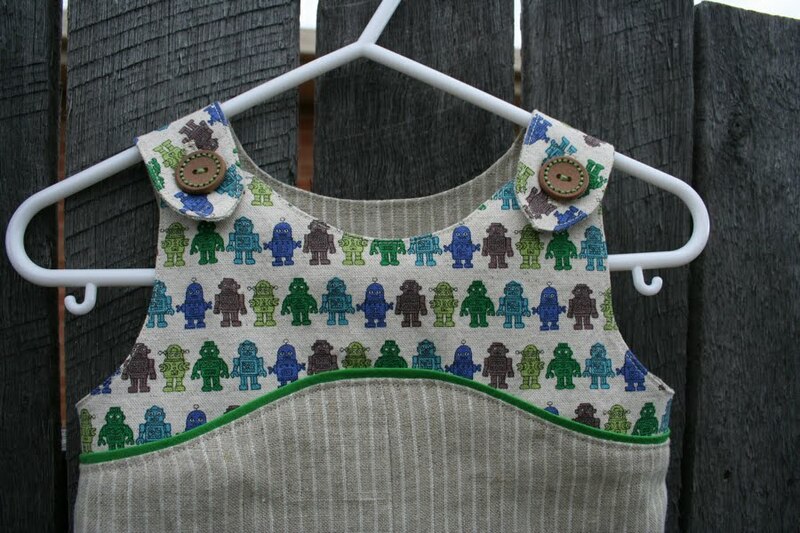 This is a size 6-12 months, so intended for baby E to wear this coming (Australian) Summer. I used some of my stash of Kokka robots for the bodice, and a really lovely, super light, striped linen for the shorts. 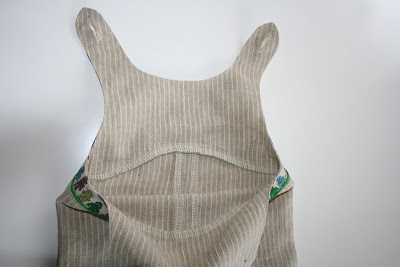 The bodice is also lined in the linen. The linen had a beautiful drape, but was so hard to work with. I swear it was alive... it just moved - my seams were all a bit uneven because of it. In the end I overlocked each piece before sewing, which gave it some stability and meant I didn't have to finish the seams post-production (again, lazy!). The piping is one of the many green Kona solids, and while I was initially worried it was too bright, I like the pop of colour it gives the playsuit. Construction was straightforward. I used snaptape for the crotch and am pretty happy with the way it turned out. It seems kind of bulky against the light linen but I'm sure with a cute little nappied baby bum in there it will be fine. In any case the snaptape was so much easier than worrying about whether regular snaps are aligned properly. 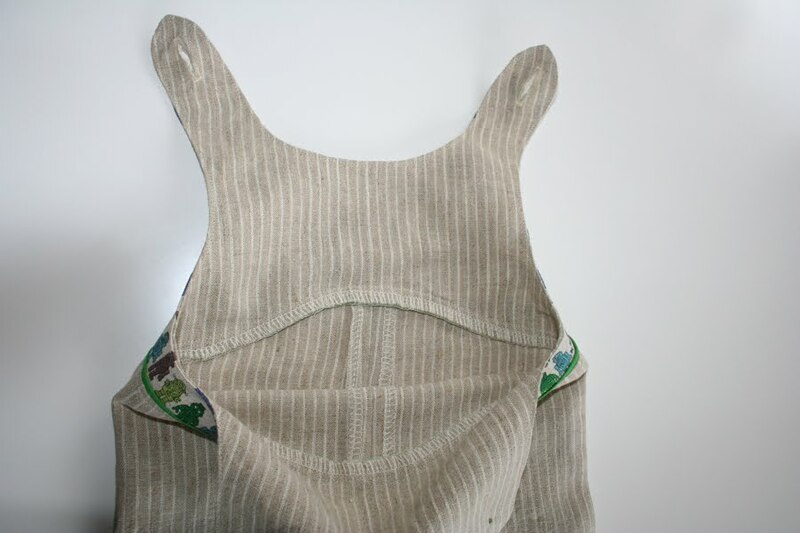 The bodice is lined in the same linen as the shorts, which gives a very clean finish to the inside. The buttons, hand stitched with green floss. My initial linen covered buttons were a disaster (you could see the aluminium button through the linen on my first attempt, then when I interfaced it it wouldn't snap in on the second attempt). I didn't remember I had these buttons until I was fishing through my button box. I bought them on a trip to Hong Kong last month for the lovely Nicole, who was searching for them. If you ever are in Hong Kong, go and visit Sham Shui Po. It's home to the craft district and is absolute heaven - so many treasures at very cheap prices. The buttons are perfect and the romper is very bespoke and chic-love the linen! 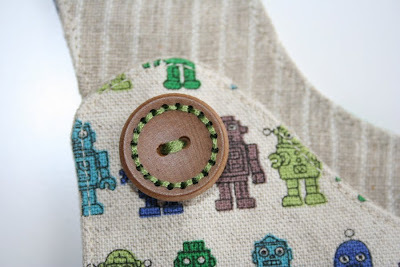 Thank you again for my buttons and I cannot wait to sew for your baby! This is fantastic Claire! What a lucky babe! Those buttons are absolutely fabulous! And the romper is too!